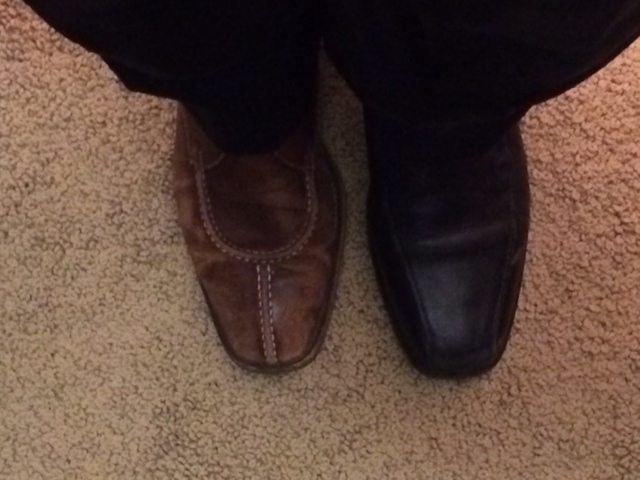 As I got out of my car this morning, I looked down at my shoes. “That’s not something you see everyday,” I said out loud. On my left foot, I had a black shoe on. On my right, a brown one. All I could do was laugh. Didn’t get upset. Or mad. Just laughed. Perfect shoes for an imperfect moment! My 1st grader has become somewhat of a permanent roommate in a sleeping bag on the floor of our bedroom. He even refers to it as “our room” in his conversations. Pretty soon he’ll start to tape up posters on the wall, I think. Since he was still sleeping, I put on my shoes in the dark (obviously! ), and didn’t notice until I got out of my car. So to solve the problem I went to Marshalls–not open yet. Daytons? Nope. How about that fancy new shoe shop in the skyway? Guy in there drinking coffee, but door locked. So I went to Target. Meronas for $25 saved the day. Sometimes life throws you a curveball–how you choose to deal with it is up to you. Today I chose to just roll with it, make fun of myself, and share my story of imperfection with you today. At least now I have a spare pair of dress shoes! The most powerful comment or “like” I ever received was neither a comment nor a like. It wasn’t even out loud. Someone told me privately that on this particular day, their spouse was having a real hard time. He said he shared my story with her to let her know that everyone has things go sideways from time to time. She laughed when he showed her my picture and subsequently recovered. He wanted me to know—personally–that my words helped. That was pretty humbling to me. I am a fledgling blogger. For any others out there starting to share your stories and work out loud, don’t get caught up in the number of comments or likes. Your impact through writing can’t always be measured. This entry was posted in Leadership, Work Out Loud and tagged Vunerability on July 15, 2014 by omarreece. I always wondered what the heck a ‘like’ was supposed to mean. I think that letting go of any expectation is important. Examine your motivation for writing and you’ll most likely discover that you’re doing this for yourself mostly, and then let the words take on a life of their own when others intersect with them. You just never know how or when your insights will impact others. Just the other day, my daughter thanked me for some advice I had given her long ago. It was just coming to fruition now, all these years later. You are right on. I love your perspective on this–it really helps!